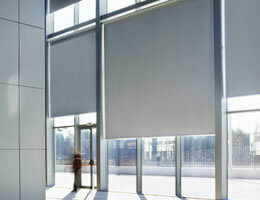 Our Suntec Blackout Vinyl Roller Shade is a high-energy efficient and eco-friendly window treatment. This shade will block out sun light from entering your room and give you plenty of privacy. Please keep in mind that the fabric is room darkening, light may enter on the sides of the roller shades. The simple lines and neutral tones offered by this product are ideal for any room in your home. Made from high quality polyester and fiberglass materials that will stand the test of time. We recommend ordering free samples if you want a specific color match. This blackout roller shade has two upgrade options available. The first is a cassette headrail that comes with a matching fabric strip. The Cassette headrail offers a more finished, cleaner look that hides the roller blind components. The second option is motorization. Raise and lower your shade with the use of a remote or by the touch of a button. These upgrade options can be viewed by clicking the upgrade tab below. See specs below for deductions and gaps. These timeless pull down blinds come standard with a lift cord. Note: Roller shades over 72" wide will come with a seam. Totally blackout and are a nice quality. Totally blackout and are a nice quality. The roller works smoothly. I re-ordered this for another room. Great blackout shade. Fit perfectly and helps to keep the room cooler as well. It's been two years since we purchased and no problems so far! Just perfect in the bedroom of my motorhome. Just perfect in the bedroom of my motorhome. all lights on - cant see anything from the outside. great product!! Easy to install. Quality as expected.